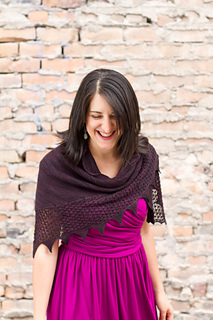 This easy and delicate shoulder shawl is a great transitional piece for those chilly fall mornings, or it makes the leap to winter wear under your favorite dress coat. 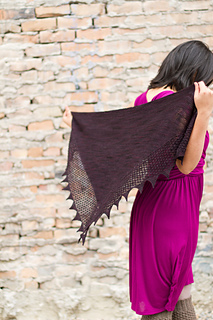 The solid garter stitch body is a breeze to knit, while the Bramble Stitch border is deceptively simple to work. 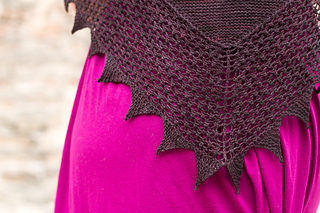 The body of this shawl is worked from the bottom point to the long wingspan edge with slipped stitches at the beginning of each row, then the border is picked up along the slipped stitches on both edges of the triangle and knitted outward. This pattern is written out, not charted. The center stitch of the border is underlined. 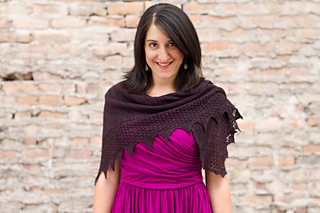 During the border of this shawl, you will need to work yarn overs between knits and purls. 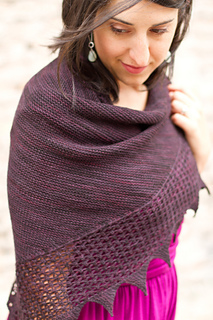 To work a yo after a purl and before a knit: leave the yarn in the purl position and knit the next stitch. The yarn over will be created as you work the knit. To work a yo after a knit and before a purl: bring yarn to the front between the needles, then wrap it over the needle and back under the needle to the front of the work. It will be anchored when you work the purl. Stitches Used: knit, purl, p3tog, slipped stitches with yarn in front and with yarn in back, use of markers, knit front and back, knit front back and front, wrap & turn short rows with detailed instructions included in the pattern. NOTE: The body cast on should read: With smaller needle, cast on 3 sts. The use of the smaller needle for the body is mentioned in the notes, but not specified in the pattern text, so this should clarify that.